The European Union has committed to speeding up and intensifying the deportation of people who do not qualify for asylum. A meeting of EU interior ministers agreed that the Frontex border agency set would start the organization of return flights and promised more staff for the organization to deal with the crisis. It said detention could be used as a measure of last resort to make sure failed applicants actually go back and insisted enough pre-departure detention centers should be available. At the same time most member states backed proposals to reinforce the EU's porous external borders. The European Union has earmarked more than 400 million euros in additional funding to tackle the refugee emergency. Most of the money _ 300 million euros _ will be used to help Syrian refugees in countries outside the EU, including Turkey, Lebanon and Jordan. It will also fund the creation of 120 jobs in the three key European agencies working on the migration frontline; the Frontex border agency, the EASO asylum support office and the policy agency Europol. Nobel prize winning Belarus author Svetlana Alexievich, who has railed against authoritarianism in her homeland and neighboring Russia, said today that people should not submit to totalitarian systems. Police in southern Sweden say they have removed an illegal tent camp that stateless Palestinians set up in early August outside the Swedish Immigration Agency to protest against the rejection of their asylum applications. Ewa-Gun Westford, police spokeswoman in Malmo, says the protesters are welcome to stay but their tents have been removed. She said today's action came after Sweden's third- largest city on September 22 banned the camp housing some 100 people on public property. The Hungarian government has authorized allowing troops from countries in the European Union or NATO to help defend the country's borders in the midst of the migrant crisis. A government decree published today says up to 1,000 troops from Hungary's allies can take part until March 15 in the “Common Will'' operation of border defense. Their tasks may include participating in joint exercises as well as direct support of the Hungarian troops on the border. Some 4,700 Hungarian soldiers are now at the country's southern borders with Serbia and Croatia. 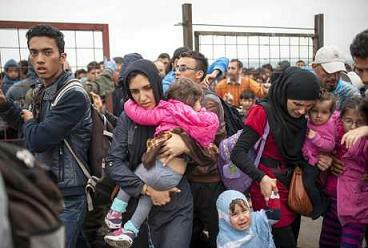 (Pictured, migrants in Hegyeshalom at the Austrian border, 169 km west of Budapest, Hungary on Wednesday). Zsolt Nemeth, head of Parliament's foreign relations committee, saw nothing unusual about EU countries sending troops to guard a border with another EU country, even if Croatia is not in the EU's Schengen zone of passport-free travel. “The EU has to be able to defend border sections which some countries can't protect from migrants,'' Nemeth said earlier this week in an interview with The Associated Press. 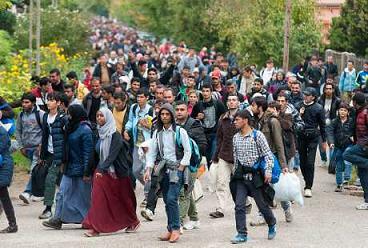 Over 330,000 migrants have entered Hungary this year. Trash is piling up on Paris streets because of a strike by garbage collectors angry over wage and career stagnation. The walkout comes amid frustration over spending cuts across the French economy. Garbage collectors and workers from Air France, which saw violent protests this week over job cuts, plan to join a general protest today. Overflowing garbage bins crowded sidewalks in about half of Paris' districts, or arrondissements, as the strike entered its fourth day Thursday. City hall said 45 percent of the city's 4,900 waste workers are on strike. Britain urged the European Union to speed up the deportation of people who do not qualify for asylum as the EU struggles with its biggest refugee emergency in decades. More than 500,000 people have arrived this year seeking sanctuary or jobs. But of people who fail to obtain asylum or residency in the 28-nation EU, less than 40 percent actually go back. “We need to see Europe upping its game,'' Britain's interior minister, Theresa May, (Pictured), told reporters ahead of talks in Luxembourg. May urged Britain's partners to take more refugees directly from camps in Turkey, Lebanon and Jordan _ which is Britain's policy. Britain has announced it will accept 20,000 Syrians from refugee camps over the next five years. The EU interior ministers are likely to agree to crack down on migrants who have been refused entry into the bloc so they can be swiftly sent home. This could include tougher measures to put those who have to leave in pre-departure detention to make sure they don't disappear and live illegally in EU nations. The focus on deportation and detention makes for uncomfortable debate as Europe faces a humanitarian emergency unseen since World War II. “The control of external borders, immigration generally, and returns _ it's all a package. We have to get to work on it,'' Luxembourg Foreign Minister Jean Asselborn said as he arrived to chair the meeting. An Israeli soldier was stabbed in Tel Aviv today and her attacker was shot, police and the military said, the latest in a series of assaults spreading fear among Israelis. Thirty-three people are still missing five days after a deadly US air strike on a hospital in the Afghan city of Kunduz, medical charity Doctors Without Borders said. Of the missing, nine are patients and 24 are staff, according to Guilhem Molinie, country representative for Doctors Without Borders (MSF) in Afghanistan. 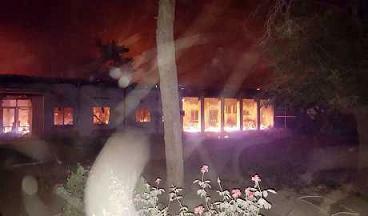 The strike in the early hours of October 3 killed 12 MSF staff and 10 patients, prompting the charity to close the trauma center. A New York Times report this week said the top US and NATO commander in Afghanistan thought American forces had broken their own rules of engagement in carrying out the strike. US President Barack Obama apologized to MSF head Joanne Liu, admitting the strike was a mistake. Three separate inquiries have been begun by the US military, NATO and Afghan officials. But MSF demanded an international investigation, saying the bombing raid was in contravention of the Geneva Conventions.